Late summer means that produce from your garden or farmers’ market is at its peak—perfect for a supper salad like this one provided by holistic nutrition coach Linda Wagner. If desired, you can easily sub out the chicken with nuts, veggie burger or other alternative. Make extras and you have lunch as well! 1 cup almond flour—you can also use coconut flour or leftover almond pulp from making homemade almond milk!! 1 tablespoon spice of choice; for this recipe, I used organic steak seasoning to give it a more intense flavor. 1. For the Almond-Crusted Chicken, you’ll need to preheat oven to 400 degrees, line a large baking sheet with foil, and set aside. 2. You will need two large bowls. In the first bowl, add your almond meal, salt, pepper, and spices and mix thoroughly. 3. In a second large bowl, crack one egg and beat with a fork or whisk until combined. 4. Dip each chicken breast into the egg mixture and coat both sides. Then dip the coated chicken into the almond meal mixture, coat both sides and place on a large baking sheet lined with foil. 5. For the Balsamic Roasted Veggies, you’ll place your Brussels sprouts (you can also add other veggies if you like; I love using broccoli in this recipe too) in a large ziplock bag with a drizzle of olive oil. Seal the bag and toss until coated. Place your Brussels onto the baking dish with your chicken and sprinkle with fresh cracked pepper and sea salt. 6. Bake your chicken and veggies for about 10–15 mins or until Brussels are just starting to soften. Switch the oven to “Broil” and remove the tray from the oven. Drizzle your veggies with a generous amount of balsamic glaze and then place on the top shelf to broil for just a few minutes, watching carefully, until your veggies are nice and browned/slightly charred. 7. Use a spatula to remove your veggies and set aside. Switch the oven back to “Bake” and continue to bake your chicken for another 5–10 mins until cooked through. 8. 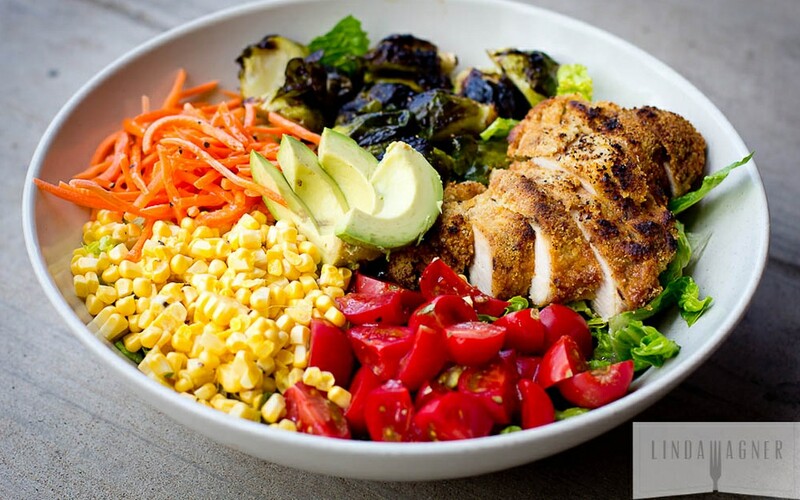 In a large salad bowl, layer with romaine lettuce on the bottom and then create sections with your favorite veggies and protein.